Enjoy your holiday by the Tuscan sea! Podere San Giuseppe Holiday Apartments is a rural construction of the nineteenth century on the via Aurelia between the Sea and the Tuscan hills. 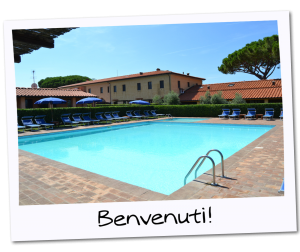 It is an ideal venue for a very relaxing holiday, not far away from the center of San Vincenzo and the sand beaches of the Etruscan coast where you can enjoy nature and relax. The house has been restored and today is a complex of holiday apartments. Guests can spend a lovely stay close to nature, far from hectic city life and just five minutes driving distance from the sea, the shops and the center of San Vincenzo. Our guests can enjoy a big swimming pool for the adults and a small one for children, green area, a small gym, children playground, barbecue area with tables and chairs, a common living room where you can talk, drink coffee or read a book. Your pets are also welcome. We have some dedicated areas for them. Roberta and Maria will be at the reception desk ready to assist you with useful information about our surroundings and all the many activities to do; natural and historical tours, nice beaches, very good restaurants and interesting shopping malls.